Aluminum cylinder head with large combustion chamber suitable for Piaggio LC cylinder kit by NARAKU (Part Number: NK102.66), also suitable for other 70cc cylinders with 47mm bore. The larger combustion chamber will solve the electric start issues due to the higher compression on the bore kits. 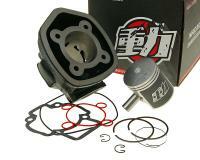 Matching Naraku Performance Cylinder kit is item NK102.66. Naraku is one of the best known scooter brands from Taiwan. The company has made a name for itself when it comes to after-market racing scooter products and professional Piaggio and Vespa replacement engine parts. 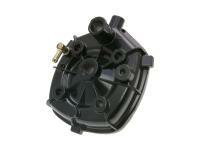 As our in-house performance brand we carry the full range of Naraku Piaggio performance products. We carry more Naraku items than any other distributor. When selecting Naraku or any major performance brand we suggest not to mix and match brands know that Naraku components are designed to work with other Naraku components for the best performance possibilities. Keeping your racing upgrades in the same brand makes it easier to tune since they are designed to work with each other. Naraku is one of our top tier brands with our highest recommendation. They have an excellent price range, model selection, and the highest quality. For all your Naraku needs make sure to select Racing Planet USA.